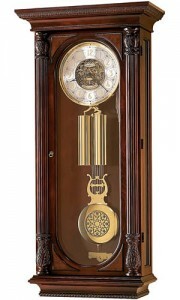 A pendulum clock is a clock that uses a pendulum, a swinging weight as its timekeeping element. From its invention in 1656 by Christiaan Huygens until the 1930s, the pendulum clock was the world’s most precise timekeeper. Pendulum clocks had to be stationary and level to operate. Any motion or accelerations will affect the motion of the pendulum causing loss or gain of pendulum speed and beat. 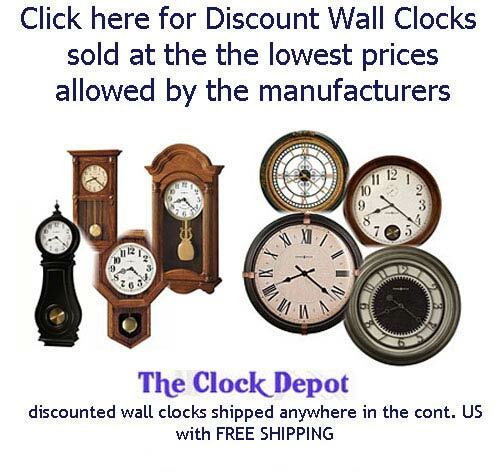 Antique Pendulum Clocks are now kept mostly for their decorative and antique value. Galileo and his son had the idea for a pendulum clock in 1637, but neither lived to finish it. The introduction of the pendulum increased the accuracy of clocks enormously from about 15 minutes per day to 15 seconds per day leading to their rapid spread replacing older designs. Early pendulum clocks had wide pendulum swings of up to 100° due to their verge escapements. In his 1673 analysis of pendulums, Huygens showed that wide swings made the pendulum inaccurate. Clockmakers realized that only pendulums with small swings of a few degrees are isochronous motivated the invention of the anchor escapement around 1670. This design reduced the pendulum’s swing to 4°-6°. In addition to increased accuracy, this allowed the clock’s case to accommodate longer, slower pendulums, which needed less power and caused less wear on the movement. The seconds pendulum (also called the Royal pendulum) in which each swing takes one second, which is about one metre (39.37 in) long, became widely used. The long narrow clocks built around these pendulums, first made by William Clement around 1680, became known as tall case clocks and later, grandfather clocks. The increased accuracy resulting from these developments caused the minute hand to be added to clock dials around 1690. The deadbeat escapement invented in 1675 by Richard Towneley and popularized by George Graham around 1715 in his precision regulator clocks gradually replaced the anchor escapement and is still used in most modern pendulum clocks. Observation that pendulum clocks slowed down in summer brought the realization that thermal expansion and contraction of the pendulum rod with changes in temperature was a large source of error. This was solved by the invention of temperature-compensated pendulums. The mercury pendulum by George Graham in 1721 and the gridiron pendulum by John Harrison in 1726. By using vials of mercury on the base of the pendulum, the mercury would expand or contract to “compensate” for differences in temperature making the pendulum more accurate. 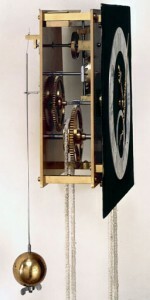 By the mid 1700 precision pendulum clocks achieved accuracies of a few seconds per week. More accurate pendulum clocks, called regulators were installed largly in public areas and used to schedule work and set other clocks. 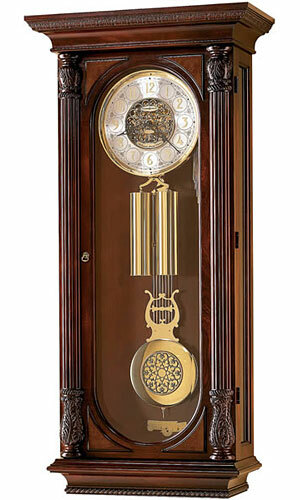 Pendulum clocks remained the world standard for accurate timekeeping for over 270 years and were used as standards through the 1940s until the invention of the quartz clock in 1927.